Ultra Skunk by Dutch Passion: it may sound like a somewhat cheap marketing trick, because what exactly is the ‘ultra’ feature of (the weed seeds of) this plant? Well, that can be clarified quite quickly. When you cultivate this plant and you have a look at the result just before the harvest, you will probably be amazed by the buds. 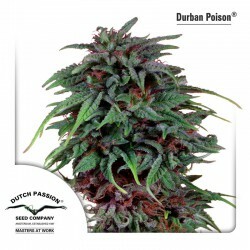 Ultra Skunk by Dutch Passion: it may sound like a somewhat cheap marketing trick, because what exactly is the ‘ultra’ feature of (the weed seeds of) this plant? Well, that can be clarified quite quickly. When you cultivate this plant and you have a look at the result just before the harvest, you will probably be amazed by the buds. These are extremely – you could say ‘ultra’ – thick! Naturally, appearance is not everything because what does this mean for the quality? The quality is exactly what you may expect: all positive Skunk characteristics are included. An ongoing ‘up high’ and a fruity taste during smoking. Is there something else that stands out in the Ultra Skunk? Absolutely, the leaves that can be present in the buds already give it away a little: this is a combination of 60 percent sativa and 40 percent indica. The person growing the Ultra Skunk cannabis seeds indoors can harvest an abundant yield after approximately 8 weeks. The plants are quite modest in height, approximately 70 centimetres, but on the other hand applies all the more to this type: ‘size doesn’t matter’.